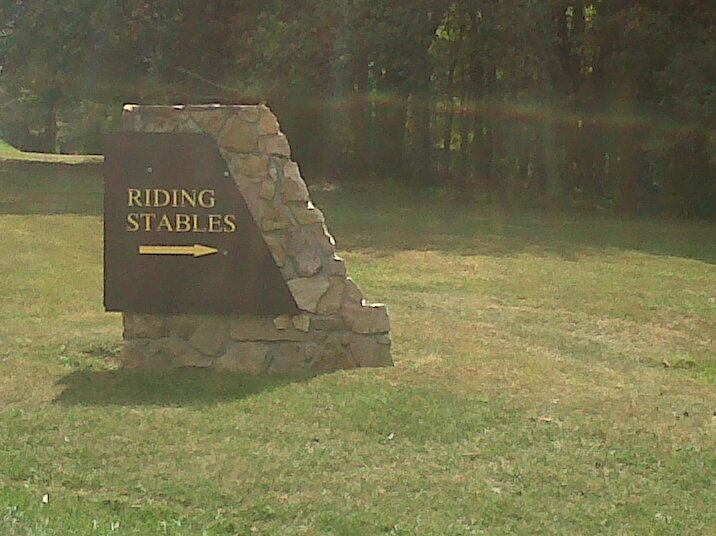 This morning, I went horseback riding at Pipestem Resort State Park in West Virginia. The adventure started with the drive from where I’m staying in Asbury, WV around mountain-like hills through a couple of pint-sized towns to unincorporated area of Pipestem. The drive reminded me a little of when I drove up Beech Mountain, North Carolina a few years back for a ski trip. Once we (my coworker and I) arrived at the park, I thought my nerves would kick in, but I was evermore excited. We went into the stables (until the smell overwhelmed us) and watched as the horses of various colors (rich browns, black, white, a peculiar gray) were tended to. Finally, we met our horses. My coworker got a horse named Tom, and I got the lovely Molly, who was silky black with a black and auburn streaked mane. My yoga came in handy as I managed to get my leg high enough in the air to get my foot in the stirrup to hoist myself onto Molly’s back. Yep, I’m proud to have not needed a step stool! As Molly and I started our journey on a path she’s travelled who knows how many times, I wondered to myself if she cares about carrying folks on her back every day. I also noticed that while Molly was pretty easy to “steer,” pulling her left, right, and telling her to slow down or stop for a second, she definitely did things on her own terms, stopping to eat flowers when she pleased, but never veering off path or causing us to be left behind. I rode Molly through wooded areas and through meadow like areas, noticing how Molly took care in her steps when the trail was on a decline or when it was rocky. As I enjoyed the view, the peace, and the quiet, I took some time to be one with my own thoughts. I remembered when my granddaddy P.H. had horses, a time when he was a strong man with authority and leadership oozing through his pores. I remembered when my cousin Billequa and I rode camels at the Jackson Zoo as kids. I daydreamed about the possibility of ever owning a horse like Molly. I thought about my relationship and where it’s going. I thought about my parents and how they’ve been everpresent in my life. It was definitely a thoughtful morning. The only gross part was when the horse in front of me pooped… Wasn’t really ready for that, but it’s a part of life, yes, I know. Also, the whiff of poop every time we went through or around piles of it was a drag. Overall, though, it was a delightful, relaxing, awesome experience. If there’s a stable near you (or if you ever happen to find yourself in southern W. Va.), try horseback riding if you never have. Happy Friday, folks! P.S. I will add pictures when I get to a computer! Say It Ain’t So – Quality Film to Come?